Home » Academics » Schools » School of Science, Engineering and Technology » Faculty » Michael D. Losiewicz, Ph.D.
After earning his doctorate, Michael D. Losiewicz, Ph.D., was a Postdoctoral Fellow at the National Cancer Institute in the National Institutes of Health at Bethesda, Maryland, from 1992 to 1998. In this position, his research focused on cyclin dependant kinases and signal regulated kinases of the MAP family as potential targets for anti-cancer drugs. He routinely presented this research at the annual meetings of the American Association for Cancer Research (AACR). Losiewicz also authored several papers on these studies. His research interests remain in the area of cancer drug targeting. After serving as a guest professor for a year at a small college outside of New York City, Losiewicz joined St. Mary’s in August 1999. 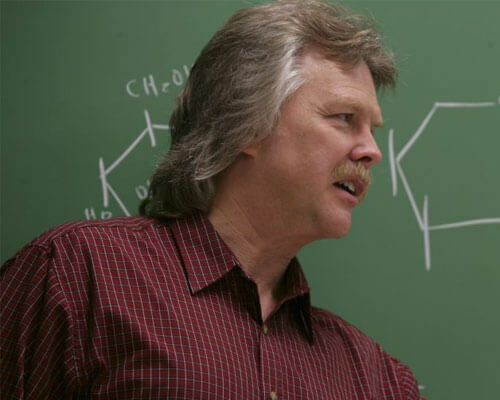 Losiewicz teaches several different lecture and laboratory courses in the Departments of Chemistry and Biochemistry. Besides his teaching, he is also the faculty adviser to the American Chemical Society of Students (ACSS), the student chemistry organization that welcomes students of all majors.